Walkways and driveways created with Unilock pavers can help you create an elegant and professional looking landscape around your home. Homeowners can install these pavers themselves, or hire an independent contractor that has been specially trained to install them. The type of Unilock pavers available varies, depending upon which region that you reside within the United States. Unilock Pavers is one of the largest paver manufacturers in North America. They offer different paving products based on which region of the United States and Canada that you live in. Each area of North America has different weather conditions that dictates which product will work best in a particular location. Unilock has several paver lines including Unilock Select, tumbled pavers, classic pavers, permeable pavers, industrial pavers and walls. 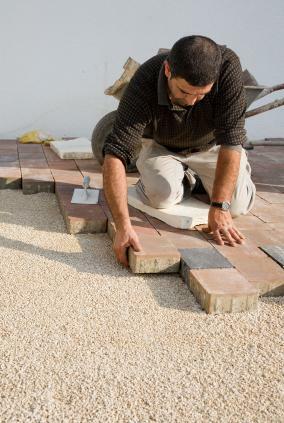 Before a homeowner decides to begin a Unilock pavers project, it is recommended that they either plan the project themselves, or hire a Unilock Authorized Contractor to help them. A contractor can assist in doing measurements and making accurate estimates in the scope and cost of the project. Unilock Authorized Dealers can also assist with any do-it-yourself project, by providing color samples and instructional videos. Prior to the installation of Unilock pavers, the project area needs to be marked off and excavated. Depending upon the location of the project, utility companies may need to be contacted in order to avoid cutting underground utility lines. This is a free service, however, they may require a week or two before they are able to visit your property. Excavation can begin once the area has been marked off and cleared by the utility companies. This requires digging to the minimum depth required for the installation of the base materials and pavers. The base is very important to the final look of the Unilock pavers project. This base includes laying landscaping cloth to inhibit weed growth and gravel. After the gravel has been applied, it needs to be compacted and sloped correctly so that when the pavers are installed, standing water will not accumulate on the surface of the pavers. After the base has been compacted, a thick layer of sand is applied, usually about one inch deep. A one-inch pipe can be used as a guide to ensure an even thickness of sand in the project area. Then it is removed once the paver installation begins. It is important not to walk on the screeded surface once it has been prepared for the pavers. Once the screeded surface has been prepared, it is time to install the pavers, starting with the longest, straightest side of the area. Using string to draw lines will help to keep the pavers straight. If the project requires a border, these pavers should be installed first. For special designs, special equipment may be required. To cut the pavers, a guillotine cutter can be used. If this isn't available, dry cut masonry saws or wet saws can be used to complete this part of the job. The edging is one of the most important components of a paver project. Edging keeps the pavers from shifting once they have been installed. Over time, especially in cold climates, the heaving of the ground during the winter and spring can cause the pavers to separate over time, ruining the look of the project. Compacting is one of the final stages of completing a paver project. It is a step that shouldn't be overlooked. Using a plate compactor, it is run across the surface of the pavers to ensure that they are firmly in place. The compactor should be run across the entire project area at least three times before the finishing step of the project. It is recommended that Unilock Jointing Sand be applied to the top of the pavers and pushed around to fill any of the cracks between the pavers with a push broom. This helps to create a durable surface and helps to inhibit the growth of weeds. Unilock Polymeric Sand may also be used to create a sealed joint. This will further inhibit the growth of weeds and help the pavers resist erosion. Installing pavers around your home can help add beauty and enjoyment to the area, whether you're creating a walkway, patio or an oasis in the backyard. It is a project that can be completed by both amateurs and professionals as long as the right tools are used. Find out how easy it is to create your own projects on the Unilock Pavers website.